If you have previous paddling experience and would like to learn more about safety and rescue, this is the course for you. You dont have to be an expert to participate but it is good if you have previous paddling experience. We start with a theoritical walkthrough equipment, route planning, weather forecast and risk assessment. This is followed by practicing buddy rescue, self rescue, towing with short and long leash and how to help an person that cannot re-enter or has lost the kayak. We continue to practice balance by joining kayaks in a raft and changing seats with each other. 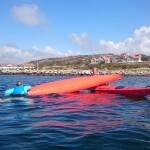 Stand up paddling with our kayaks and much more to challange our selves in a fun way and practice capsizing and rescue. The goal is that everyone should feel more secure and have better understanding of basic rescue so that next time you will go kayaking you will have a toolbox of useful techiques and planning. Bring sunprotection, water and extra clothes. We will treat you for a traditional “fika” (coffe and bun). 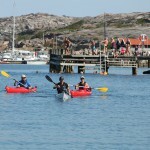 We will practice the skills that are required for european paddle pass level 2. Please let us know if you have ambitions to become certified. We will coach you and give you suggestion on what to practice before you book an individual examination of european paddel pass level 2.